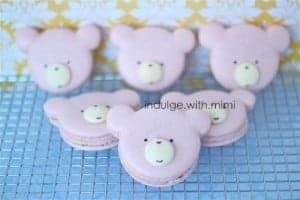 I made these little pink bears for my friend’s baby shower and as you can probably guess, it’s going to be a GIRL! Woohoo! 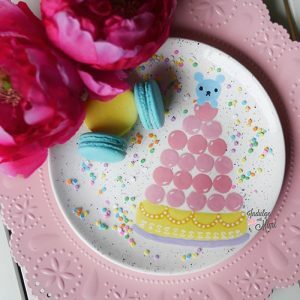 I wanted to make these bears because they are just so cute and of course, they also totally fit into the usual cutesy pink baby shower themes. Since it was a pretty big party, not everyone knew I baked them. From afar, I had the great pleasure of watching people’s reaction to these little animal faces without having to give me the obligatory “It’s so cute”… yada..yada. The general reaction was one of delight and lots of photo taking – Success! ♥ Template Shape: Draw a circle with round dots on either side for the ears. ♥ Color: I used Ameri Color Gel Colouring in #Mauve. It is such a pretty and soft muted pink color. 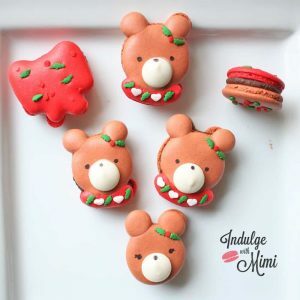 ♥ Bear Bear’s Snout: Use a white chocolate dipping wafer for the snout. It is super easy with no shaping or tempering of the chocolate required. Plus, yummy chocolate is an added bonus right!? Mix a little powdered sugar and water into a thick paste and use it as a “glue” to adhere the chocolate snout onto the face. Use an edible black pen to draw on the other details like eyes, mouth and nose. 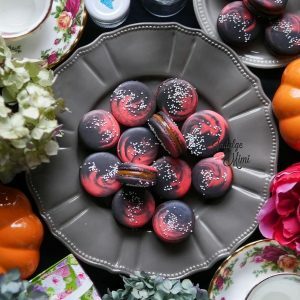 These were the first Macaron Art I have ever made and I actually had to throw out two previous batches before I got these. So don’t be discouraged! Keep trying, you’ll get there! 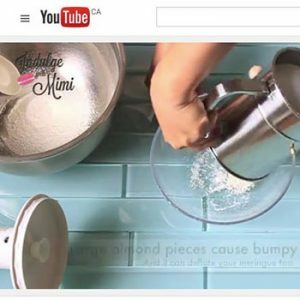 Make sure to share your baking journey with me when you have a chance. 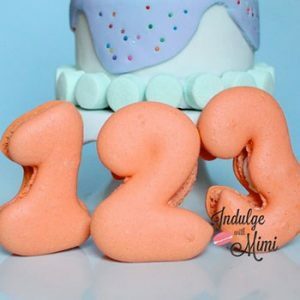 Mimi,I am desperately looking for someone to make these for me.I have a wedding coming up. 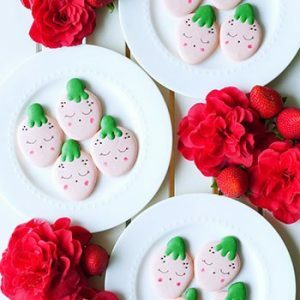 I have failed 3x now making macarons, but seeing your progress and these adorable designs gives me hope. 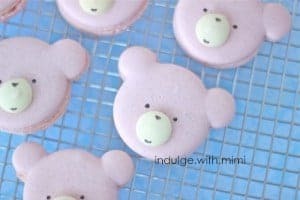 Mark my words, I WILL bake these bear macaron cookies one day! You will! I’m sure of it! Keep it up and let me know how it goes!